Waukesha Cherry-Burrell 62B Air Blow Check Valves are 'plug-style', where air pressure pushes the bonded rubber plug away from the seat. 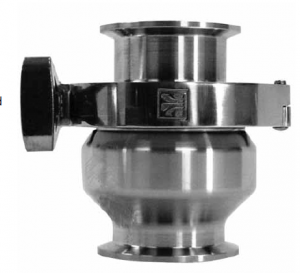 Waukesha Cherry-Burrell W45 Check Valves are "wafer-style," where product flow pushes the valve disc away from the seat. Users of manually operated valves can rely on a full complement in Waukesha Cherry-Burrell's line.